One of the few shots I have of increasingly rare trumpet fish. They hover upright, pretending to be a strand of gorgonian soft coral, and snapping to the side to slurp up a small, unsuspecting tomtate, or baby parrot fish. If you are seen to react to their presence, or if they think you have seen them, they will turn horizontal and skedaddle away. They do not swim by undulating their bodies, but rather use their very fine, almost invisible dorsal and ventral fins, located towards the back end. They can not accelerate forward very well. Instead they will use the caudal (tail) fin to turn from an ‘I’ shape to a ‘C’shape and snap up a small fish to their right or left. 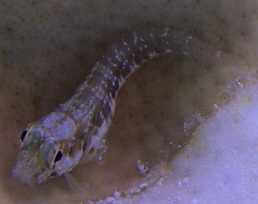 This minute blenny is the smallest one I have ever managed to photograph. Their upward looking eyes see all who approach. By being on the reef they need not worry about what is under, only above them. I once had one trained to stay on a rock even when lifted so I could put him right up to divers windows and feed him.